325 Glue Dots MICRO Clear Adhesive 34700 at Simon Says STAMP! 34700 This item is on reserve until If you would like to reserve this item now, you may purchase it now with the rest of your order. We will hold your order now and ship your entire order as soon as this item is back into stock. If you would like your order to ship now, please place this item on a separate order. Success, 325 Glue Dots MICRO Clear Adhesive 34700 has been shared! Micro Glue Dots. These tiny, double-sided adhesives are perfect for permanently bonding items like rhinestones, beads, pictures, ribbon and sequins! Glue Dots bond to most surfaces including paper, plastic, metal, wood, foam, textiles and more. This package contains 325 1/8 inch round super-strength clear adhesives. Acid free, archival quality. Non-toxic. Founded in 1997, Glue Dots International revolutionized the adhesives industry with instant bonding adhesive products under the Glue Dots brand name. Glue Dots are double-sided adhesives that bond instantly to virtually any surface. They are mess-free, easy-to-use, non-toxic and require no dry time; making home repairs and DIY projects quick and easy. 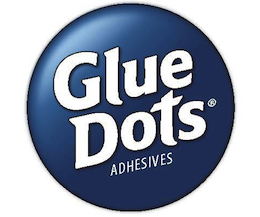 Glue Dots adhesives are perfect for school, at home or in the office.